There are 39 seconds left. Ali Sow is bringing the ball up for Laurier. Windsor is clinging onto an 84-82 lead after Lancers guard Chris Poloniato got blocked at the rim by Kemel Archer. Sow goes to the right wing, he gets a switch of defenders after a Kemel Archer screen. Poloniato creeps towards Sow from the left wing, leaving fifth year guard Chuder Teny all alone. Sow quickly makes the swing pass to Teny seeing Poloniato coming over and Teny calls game hitting a wide open trey to make it 85-84. The crowd along with Laurier’s bench erupts! Laurier went on to win. “Ali finding him was the thing we talked about the whole season. If they cheat the strong side, let’s swing it for shots. You see James Harden do that, you see a lot NBA players do that. We’re trying to attack certain players, they’re loading up, a swing pass can make a big difference. To have the clarity to make that play down the stretch was crazy,” coach Serresse said. 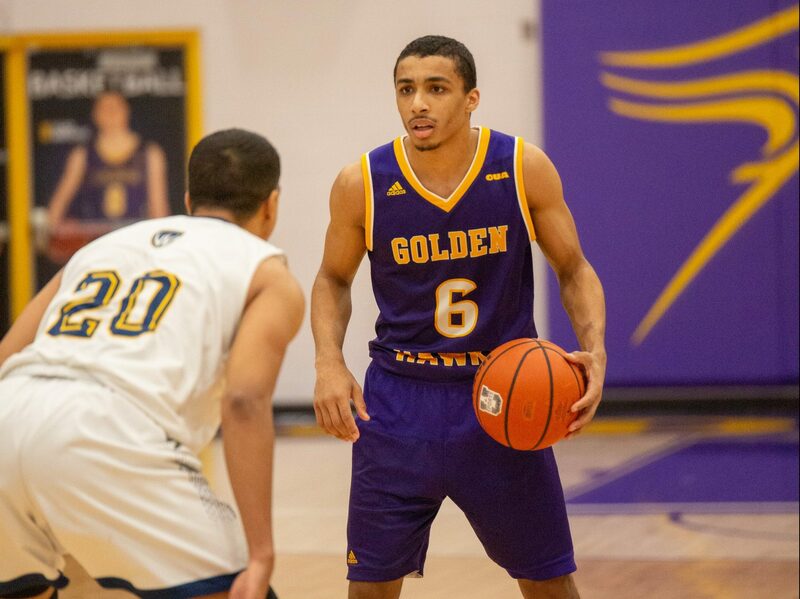 Ali Sow has been making big plays all year for the number nine Laurier Golden Hawks. He is the second leading scorer in the country at 27 points per game, making him the lead guy in his second year. His scoring prowess has led him onto the path to smashing the single season scoring record at Laurier previously held by Kale Harrison with 466 points in 2010-2011. “It feels good. That kind of individual accomplishment is really cool to think about after the season, but right now I’m more focused on the team and how we’re playing and I’m really excited about how the team’s playing and our future towards the playoffs,” Sow said. Since breaking the record against the Waterloo Warriors on Jan. 25, he has continued the tear he’s been on. Against Western, he scored 17 straight points in the three-minute and 10 seconds stretch between the end of the third quarter and beginning of the fourth quarter. He went on to finish with 32 points, with 22 scored in the second half. “First half, I’m usually looking to find the flow of the game, find the pace of the game, see what the defence is giving me, see how they’re playing me. In the second half, I knew we were kind of struggling, especially in both games, Western and today [Windsor]. I just thought I had to be more aggressive and put more pressure on the defence. It turned out in our favour, I was able to score a bit and once I made a couple, they were loading up on me, so I was able to find my teammates as well,” Sow said. Against Windsor, it was much of the same as he scored 20 points in the second half, leading the charge to a comeback victory. He finished with 30 points, five rebounds and six assists, with the final assist coming on the game-winner from Teny who finished the game 18 points off the bench. “I thought Ali, for me, that was his most complete game offensively, in terms of the passing and scoring and then Chuder just icing the game there was big,” coach Serresse stated. While being in a great position sitting as the number one seed in the OUA West at 15-5, they still do have the pressure of winning every game from here on out to claim home court in the West. With the Brock Badgers breathing down their neck just a game behind them and owning the tiebreaker, the ball is in the Hawks’ court when it comes to their destiny. Next up will be the red hot Lakehead Thunderwolves who will be coming for back-to-back matchups in Waterloo. Author: Abdulhamid IbrahimNow a fourth year student at Laurier as a double major Communication Studies and Cultural Studies student, as well as the Sports Manager of Radio Laurier, Abdulhamid will look to play a key role once again in the sports section returning as the Lead Sports Reporter for The Cord.